What’s next? The launch of anuCriti, a new brand in the fashion world, by Prodipta Roy featuring a vast range of designer handwoven saris, blouses, salwars, kurtis, Mekhala and western ware. 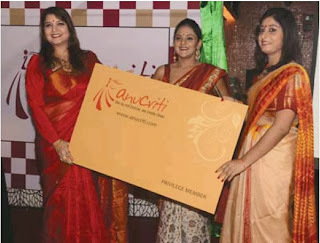 Actress Pallavi Chatterjee was present to launch the brand. Said Prodipta, “I didn’t have any formal training in designing clothes. What is a festive season without music! So, here’s news from Power FM. They have relaunched the station with a fresh approach. It involves the Gaanguli Contest, which offers the chance to get up close and personal with popular music composer Jeet Ganguly. The composer was present at Asutosh College to speak about this initiative. This contest is a prelude to the grand concert, Gaaner Power – Jeet Gannguli Live-In-Concert, that is being organised by Power FM to day (21 September) at City Centre 2, Rajarhat. “Power FM caters to no-nonsense youth who want a pure listening experience. Unfortunately there is a huge gap for those who want to listen to the current top selling and popular Bengali and Hindi songs. We intend to fill that gap. Jeet Ganguly is the biggest name in today’s contemporary Bengal and Hindi film music genre. We are extremely happy to have him with us. The contest will give upcoming talent of the city the chance to showcase their vocal prowess,” said Sonia Choudhury, manager — station and programing.